An effective way to ensure students explore new topics and practice new skills on a daily basis is by answering worksheets. Whether you are teaching vocabulary, writing, science or math, you can easily create worksheets that match the lessons for the day. Create a worksheet in 5 easy steps. Create a new Canva account to get started with your own worksheet design. Tailor-fit your worksheets to match your lessons. Select from hundreds of templates and countless design elements to make your worksheets truly an effective and fun learning experience. Add the title and contents of your worksheet with our editor filled with fonts and typography elements. Make your design engaging with free and premium educational images from our library or insert photos from your drive using our uploader. Do you want to have puzzles, mazes, letter and picture matches, math tables or crossword formats? You can do so with the help of hundreds of design elements — from lines and grids to shapes and icons. The drag-and-drop simplicity of our design features allows you to customize your worksheets in fun and creative ways. With school books now becoming accessible in an electronic file, worksheets are definitely not exempt from this. You can choose to have your worksheets available digitally or kick it old school by printing out your design for your students. If you’re printing out your worksheets, make sure to select the PDF – Print option to ensure the best resolution for printing. To ensure your worksheets are uniform for the whole grade or year level and informative down to the last detail, you’ll need to get your co-teachers’ insights and feedback. Teachers run hectic schedules every day, and collaborating face-to-face can be hard. Canva makes it easy to work with your co-educators with our practical share features on the editor toolbar. Once you’re done creating a worksheet, click on the Share button and get your design’s unique link. Decide whether to give them viewing or editing access before sending the link via their email addresses or simply message it to them. 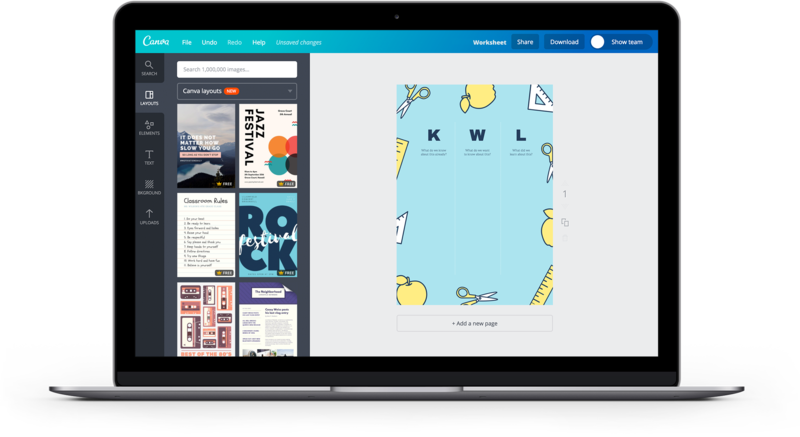 After logging into their own Canva accounts, they can view and edit your worksheet on any computer, iPhone or iPad device. Simply head on over to www.canva.com to start creating your worksheets. You don’t need to download Canva, just create an account and log in. If you want to design on the go, why not add our iOS and Android apps to your mobile devices? They’re free to download from the App Store or from Google Play. How can I format the text for my worksheets? You can edit your text a variety of ways to make sure it fits your design needs. Using the text tools, you can change the font type, size, color, emphasis, alignment, spacing, and transparency. You can also turn your text into a bulleted or numbered list.